Syrian activists says several dozen people injured in chemical attacks in the northwestern province of Idlib. Syrian activists and a doctor reported Thursday of new suspected chemical attacks in the northwestern province of Idlib, leaving several dozens of people suffering from asphyxiation, according to The Associated Press (AP). Tennari, who spoke with AP from near the border with Turkey, shared field reports from doctors in the three villages that were reportedly hit. 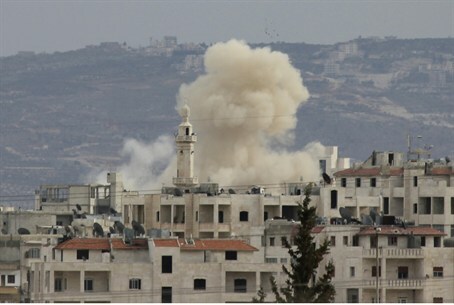 The reports said government helicopters dropped barrel bombs containing chlorine on the villages of Janoudieh, Kansafrah, and Kafr Batiekh on Thursday. The Syrian Network for Human Rights, a monitoring group which is based outside the country, also reported the three different attacks, according to AP. The group shared on Twitter images it said were from field hospitals where victims were taken. The group reported that 69 people were injured in the attacks. The reports could not be independently verified. The Syrian government has repeatedly targeted the Idlib region with barrel bombs, with Aleppo being the target of similar attacks as well. There has been an increase in reports of suspected chlorine bombs amid intensified fighting in the province where the rebels have made significant advances against government troops in recent weeks. Reports of chlorine gas attacks in Syria have become a regular occurrence over the past year. Human Rights Watch said last month that eyewitness accounts and evidence collected from northwestern Syria "strongly" suggest regime forces dropped toxic chemicals on civilians. The Organization for the Prohibition of Chemical Weapons (OPCW) chemical watchdog in January concluded "with a high degree of confidence" that chlorine gas had been used in attacks on three villages in Syria last year. At least 13 people died in the attacks that were carried out from April to August, according to the organization. Syria, however, has denied ever using chemical weapons or chlorine during the country’s brutal civil war, blaming “terror groups”, the Syrian government’s term to describe rebels, for using such weapons.